,,There’s one Food Network show we all know well. Guy Fieri’s Diners, Drive-Ins and Dives profiles some of the best hole-in-the-wall restaurants around the country with each episode featuring three in out-of-the-way locations as well as culinary delights you might not expect to find in cities, big and small, all around the great USA. Guy has paid many visits to restaurants in and around Miami and has taken the opportunity to highlight much of the unique fare that South Florida and its Latin influence bring to the dining table. Some of the restaurants in Miami that have attracted Guy’s attention include a good mix of comfort food spots and ethnic eateries with a modern Miami twist (think shrimp and grits followed by a cafecito or malanga fritters with a watercress dipping sauce). Though Fieri has made it a point to stop into the Magic City more than once, we’re highlighting a few of our favorites from his list below. This strip mall bar is a lot rowdier than you’d expect with karaoke and/or live music most days of the week. You can usually catch the game here too, whether it be basketball, football or baseball, which some would say is a plus. Some of the specialty dishes that were featured on Diners Drive-Ins and Dives include escargot and fresh mahi-mahi sandwiches, but everything here — labeled as upmarket pub food — including the scampi-style wings is yummy. Traditional island food in a Southwest Miami shopping center is always a good idea. And bona fide Jamaican food does the trick no matter the mood or season. Locals swear by the oxtail stew, curry goat and curry chicken at Jamaica Kitchen; oxtail falls right off the bone, while Jamaican patties and jerk chicken are mouthwatering add-ons. We recommend ordering a bunch of stuff to share family style. Founded by a family of Cuban fishermen, La Camaronera has been an off-the-beaten-path Miami staple for over 50 years. A few of the best dishes here include camarones fritos (fried shrimp) and cangrejo moro (Florida Stone Crab). But there’s more. All food is seafood at La Camaronera and your best bet is to try a little bit of everything, from the grouper soup to the shrimp empanadas to the fried fish sandwich. This well-known South Beach spot serves up authentic Haitian food in a warm and welcoming setting. Murals on the walls as well as Haitian art transport you to the Caribbean and live music on Thursdays and Saturdays adds a little extra pizazz to the overall lovely experience here. The marinated pork and malanga fritters are some of the best dishes at Tap Tap. The stewed oxtail entree, too. Pair your meal with a fresh juice or a rum cocktail to get the party started. 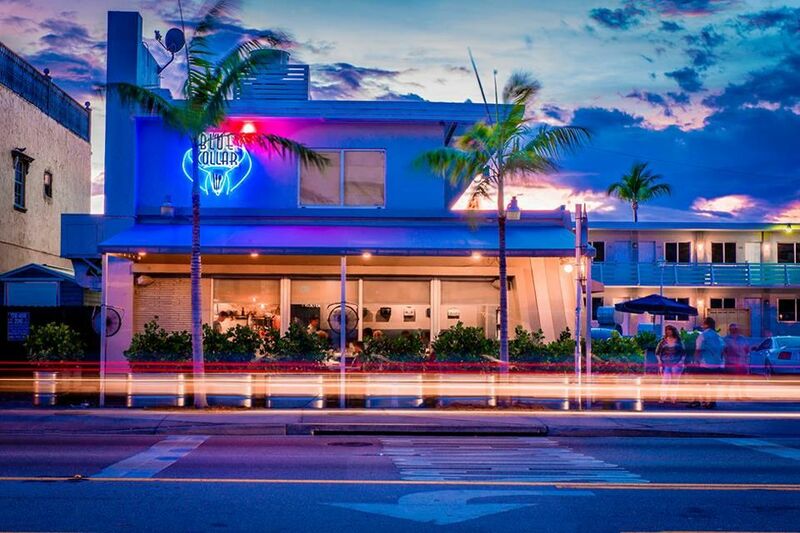 In Miami’s historic MiMo District, Blue Collar has been serving up some of the best comfort food dishes in the city for nearly seven years (wow!) though it feels like just yesterday Chef Daniel Serfer arrived on the scene. He opened Mignonette, another instant success, just two years after Blue Collar. The brunch menu consists of Eggy Stuff, Syrupy Stuff, Othery Stuff, Sandwichy Stuff, and Salady Stuff and please believe us when we say you can’t go wrong no matter what your palate fancies. For dinner, you’ll find some delightfully innovative appetizers like Chanukah Latkes (served year round) and Cuban Sandwich Spring Rolls. If you’re looking for elevated comfort food in Coral Gables, the Local is the place for you. This gastropub opened its doors in 2011 and has been slammed ever since. Indulge in a handcrafted cocktail here — with names like Grab ‘Em By the Peaches (bourbon, peach nectar, lemon, banana liqueur and Amaro) and Don’t Flick the Bean (whiskey, Irish cream, Disaronno, Amaro and Tia Maria coffee liqueur), you know you’re in for a treat or at least a wild ride. Would Guy Fieri steer you wrong? As for food, do the burger, the fish & chips or the fried chicken. In the Midtown Miami mall, Sakaya Kitchen offers creative fast-food takes on traditional Korean dishes. Don’t let counter service deter you; it’s a quick and easy way to order hassle-free before staking out a table. There are plenty of sharing options here, like house-made Dae-ji spicy pork croquetas and Bao steamed buns. Big bowls range from popcorn shrimp saam with house-made napa kimchi and pickle to honey-orange baby back ribs with ginger Brussel sprouts with Thai jasmine rice. Nom nom. Little Havana’s shining star offers up Latin bites and beer in an intimate setting that includes a hidden back patio with a tropical vibe. The restaurant boasts locally-sourced ingredients and an award-winning chorizo croquettes dish. Order those for sure and compliment your starter with a short rib burger or a pan con bistec (juicy steak sandwich). Disco truffle fries and Maduro tostones with pickled peppers are a must, too. Dessert here is phenomenal; we recommend the Nutella creme brulee and the key lime jar with passion fruit, meringue, and yellow cake streusel. Latin American food with a Southern twist on Miami’s Upper East Side (MiMo District), Loba is a family-owned Colombian restaurant that, like Doce Provisions, also uses locally-sourced ingredients when crafting its dishes. Nosh on the Vincent Van Goat, a fried goat cheese starter with local honey, pistachio and sea salt, while you wait for your mains. The lentil burger and the ajiaco (home-style potato and chicken soup with corn, cilantro, rice, sweet plantain, and avocado) are hearty and will leave you pleasantly full, but not overly stuffed. Planning to hit the road for a little Diners, Drive-Ins, and Dives adventure of your own? Other guides have put together listings of Diners Drive-Ins and Dives restaurants in multiple regions, including the exciting cities of, Albuquerque, Atlanta, Denver, Detroit, Minneapolis and St. Paul, Oklahoma City, and Utah.